Unlike most publishers within the industry, we welcome unsolicited manuscripts or query letters and you don't have to enlist the services of an established literary agent unless you want to; our doors are open. We are the new kid on the block, and because this policy is not consistent with most publishing guidelines, humungous amounts of letters and manuscript submissions may slow us down, at times, but we'll get to all of them or holler uncle until we catch up. Hard copy manuscripts or electronic submissions are acceptable. You should provide all pertinent information in the email message if you submit online, or include a cover page if you send a hard copy. It is important that writers supply a self-addressed, stamped envelope (SASE) if they want a response. If you do not want us to return the manuscript, just send a letter size envelope. We will not return your sample or respond without return postage. Self-publishing, coupled with Print On Demand (POD) services is becoming an industry standard for getting published, it allows you, the author complete control over publishing your own book. 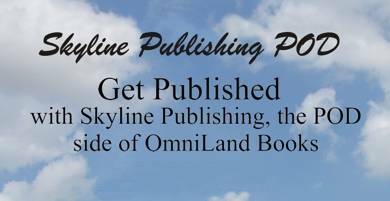 Skyline Publishing is an imprint of OmniLand Books for those who are interested in POD Self-Publishing. Click on this link to get started. Get Published.